On Tuesday, July 26, Columbus coffee lovers can meet Jorge De Leon Ovalle, a world-ranked Q Grader from Guatemala, at Crimson Cup's Upper Arlington coffee house. He will present complimentary samples of the roaster's Guatemalan Antigua Pacamara coffee. Jorge De Leon Ovalle (right), with his father, Jorge De Leon Sr. Both are Licensed Q Graders from Guatemala. Jorge’s amazing palate helped him become the world’s youngest Q Grader a few years ago, and he helped us discover the Guatemalan Antigua Pacamara coffee that we’ll be sampling. Ohio coffee roaster Crimson Cup Coffee & Tea is bringing Guatemalan Q Grader Jorge De Leon Ovalle to Columbus on Tuesday, July 26 as part of its “Meet the Farmer” coffee tasting series. De Leon will present samples of Guatemalan Antigua Pacamara coffee from 9 a.m. to 10 a.m. at Crimson Cup’s Upper Arlington coffee house at 2468 Northwest Boulevard. Q Grader is a professional accreditation from the Coffee Quality Institute that enables cuppers to grade Arabica coffees. 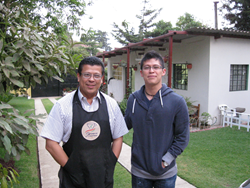 De Leon ranked as the number-one Q Grader in Guatemala and number eight worldwide at the 2015 World Cup Tasters Championship. Attendees will taste free samples of Crimson Cup’s Guatemalan Antigua Pacamara coffee, sourced through the roaster’s Friend2Farmer direct trade program. This coffee is grown at an elevation of 5,100 feet on a small estate at the foot of the massive Volcán de Agua volcano. The rich, volcanic soil produces a flavor that is subdued, richly acidic, yet balanced with pleasant floral tones. Crimson Cup developed its Friend2Farmer direct trade program to ensure that farmers receive a fair share of proceeds from coffee sales. The company pays an above-market premium to farmers, who can then invest in agricultural and community improvements. Crimson Cup coffee experts also collaborate with farmers on ways to improve the quality of the coffee and quality of life for farmers, workers and their communities. Roast magazine editors cited Crimson Cup’s work in cultivating relationships with coffee growers around the world as a factor in awarding the 2016 Macro Roaster of the Year title to the Columbus, Ohio roaster.